Iran Bans Pokémon GO — It's My Way or the Highway! Pokémon GO has become the world’s most popular mobile game since its launch in July, but not everyone loves it. Pokémon GO has officially been banned in Iran. The Iranian High Council of Virtual Spaces – the country's official body that oversees online activity – has prohibited the use of the Pokémon GO app within the country due to unspecified "security concerns," BBC reports. The Iranian council did not detail why the country has actually banned its citizen from playing the wildly popular game. Although many countries, including Russia and China, have expressed security concerns over the smash hit augmented reality game, Iran has become the first country to introduce an official ban of Pokémon GO. Since its launch, Pokémon GO has officially been released in more than 35 countries so far with over 100 Million downloads and continues to make an estimated $10 Million in daily revenue. Despite strict Internet restrictions in Iran, Pokémon fans have still managed to play the game using VPNs (virtual private networks). 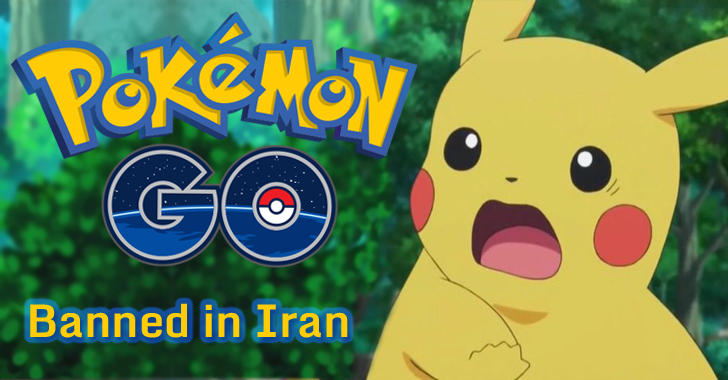 Reports last month said Iranian government was waiting to see to what extent Pokémon GO developer Niantic would co-operate with it before making the decision on banning the game. Pokemon GO's data servers must be located in Iran. Any tagged locations within the Pokemon GO app would require being coordinated with the NFCG in order to avoid including any locations of national security concern. However, it's not the first time when any country has raised concerns surrounding the game. Late last month, some Middle East nations, including the United Arab Emirates warned players against the security danger of Pokemon GO. China also reportedly warned its citizens from playing Pokémon GO, as playing the game can expose its secret bases to the United States and Japan. Also, Pokemon Go is fueling public safety fears after some accidents and robberies involving the game. The game involved a first major car crash in Auburn, New York, last month, when it was revealed that a 28-year-old car driver was playing "Pokémon GO" and got distracted, thereby ran his vehicle off the road and crashed into a tree. Even Israeli Government has restricted its army from playing Pokemon Go due to location services and cameras needed to run the game that could unwittingly expose military secrets and locations.